What are stop signs for? In the month of May I bike commuted to work in Carmichael and Citrus Heights most of the days. I had plenty of time to think about stop signs, as there are a lot of them on my regular routes. A few less, now that the county has removed some from the parkway path, but still, a lot. At most of these stop signs, there are no cars anywhere in sight, particularly at the beginning of AM and PM commute hours when I’m riding, but even at other times of day. So I started thinking, why are these stop signs here, and what are stop signs for? When there is a busy intersection with a more or less equal flow of vehicles on both streets. The four-way stop signs assist people in taking turns. When one street is so busy that gaps long enough to cross that street are rare. When there are visibility issues that prevent vehicle drivers to see each other. When motor vehicles are going too fast, and they need to be slowed down. Busy intersections: At busy intersections where there are often vehicles on the cross streets, stop signs can help people take turns. Problem is, it doesn’t always work very well. Very few people know the etiquette of taking turns. It is: a) when two vehicles arrive at the cross streets at exactly the same time, the vehicle to the right goes first; b) when two vehicles going opposing directions on the same street arrive at exactly the same time, and one is turning, the vehicle going straight goes first. However, these rules apply only to the “exactly the same time” situation. Most of the time, the rule is “first come, first serve.” This rule does not require stop signs to work. More about how other signing, or lack thereof, can work in this situation, on my next post. 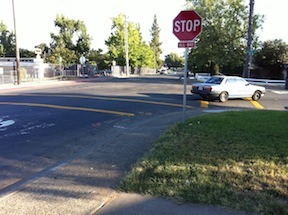 Gaps are rare: On my ride I cross a number of busy streets such as L, K, J, and I. On 18th Street, there are no stop signs or signals at the busy streets. Sometimes it seems to take forever for a gap. But when I think about it rationally, it really is not forever. At the very busiest rush hour times, it may be up to two minutes, but mostly it is a matter of seconds. And of course I have the choice to just move over and use the busy streets such as 15th and 16th, where traffic moves along reasonably well. The timing of signals is frustrating for a bicycle rider because the timing is set for motor vehicles moving 25 mph or greater, and I’m not willing to keep up that pace just to make signals, but signal timing is another issue. Visibility issues: Reason three is probably the most justifiable. Taking turns and yielding to other vehicles requires that you can see other vehicles, but visibility is sometimes restricted by buildings, vegetation, fences, parked cars, or roadway geometry (curves). The problems of vegetation and parked cars can be solved, pretty easily. Vegetation on public property and on private property should be trimmed back enough to maintain a reasonable degree of visibility. Parked cars can also be prohibited or restricted from the corners. This is called daylighting, and it not only makes things safer for vehicle drivers, but for pedestrians as well. Red curb offsets at the corners remove that last parking spot, without significantly reducing the amount of parking. Prohibition of commercial vehicles from the end spots might make sense, however, with many private SUVs being almost as big and tall as commercial vehicles, that may not make much difference. Awkward geometry or curved intersections can sometimes be regularized to 90 degrees, but this may require easements or purchase of property, and sometimes realignment of utilities, so it is the most expensive problem to solve. Speed reduction: When traffic is moving too fast, neighbors often request stop signs to slow traffic down. The theory is that drivers will then drive more slowly, but that is not what happens. Most drivers respond in two ways: accelerating hard from the stop sign to make up for lost time; and treating the stop sign as a yield sign, and only stopping to avoid collisions with other vehicles. Many drivers achieve a speed between stop signs greater than what they would have been driving if there were no stop signs. Of course some drivers use a lack of stop signs to travel at speeds greatly exceeding the speed limit, but I see that as an enforcement issue that cannot be solved with signing. The second behavior might seem like a bad thing, but I’m not so sure. As long as it is done skillfully, it results in a smoother flow of traffic, with less pollution and fuel use created to boot. 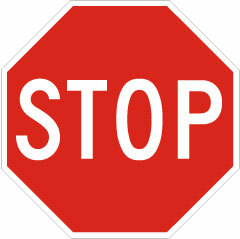 I feel that the vast majority of stop signs have been placed for purpose four, to slow traffic. If they worked for this purpose, they might be reasonable, but they really don’t work. It used to be that transportation agencies would easily bend to requests for stop signs, and that is in large part why we have so many of them. They’ve now become aware that they do little to calm traffic, and are much more resistant to requests for stop signs, but there are still some being put in, and almost none of the older, unjustifiable ones are being taken out. All four of these purposes solve problems that would not exist if the transportation system had been better designed to begin with. My next post will be on how streets ought to be designed and how to solve the existing problems. I’ve written on traffic calming ideas in Street Changes, Additional Street Changes, and many other posts (click traffic calming in the tag cloud in the right hand column). Previous Post What is a roundabout?